Even since I was at school (which really wasn't THAT long ago) there have been lots of changes and developments in education. I won't say improvements, because I'm not sure that the changes have been for the better, but lots of things are certainly different. I sometimes think of all the rumours we third years heard whispered of how these new fangled GCSE qualifications were going to change the world and that everything would be coursework based with nobody doing exams anymore. 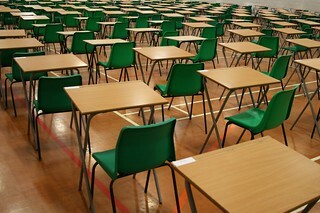 Yet still, every summer just as the hay fever season kicks in we take two hundred kids and sit them in a big room and make them answer a written paper. It's probably one of the longest lived aspects of 'modern' teaching, and people were certainly doing the same thing to the light of burning chemicals more than two hundred years ago. Much has been debated about written papers, and many people consider them unfair. They certainly are, in that they favour people who are good at exams. But other methods have been tried and they haven't succeeded. Continuous assessment isn't rigorous enough - it's too easy to manipulate by both staff and students. I reckon the only likely change that we'll see is that the papers and desks will be replaced by computers, but we've had that for several years and it's still not taking off that well. Unfair as it may be, I think PE teachers around the country will be complaining about losing their gymnasia for the summer term for many, many years to come. For the curious, I've now taken the reverse angle of this shot.